I went on my first group ride yesterday morning with the school cycling club. It was a bit depressing showing up at the meeting location with my toe clips, friction shifters, and 1989 Miyata, when everyone else present was sporting expensive carbon fiber and aluminum racing bikes with stiff racing shoes, but I ended up keeping up passably well, at least for the first half; I ended up falling behind the pack on the return trip since I wasn't really used to pumping out 20 MPH for three hours. I had some trouble riding together in such a close pack. Its a little scary to ride a foot behind someone's wheel at 20 MPH, and my rather poor bike handling certainly didn't lend me any confidence. Towards the middle of the ride I started getting more comfortable with riding in a tight group, especially when I started to feel the burn in my thighs (drafting does make life a little easier). 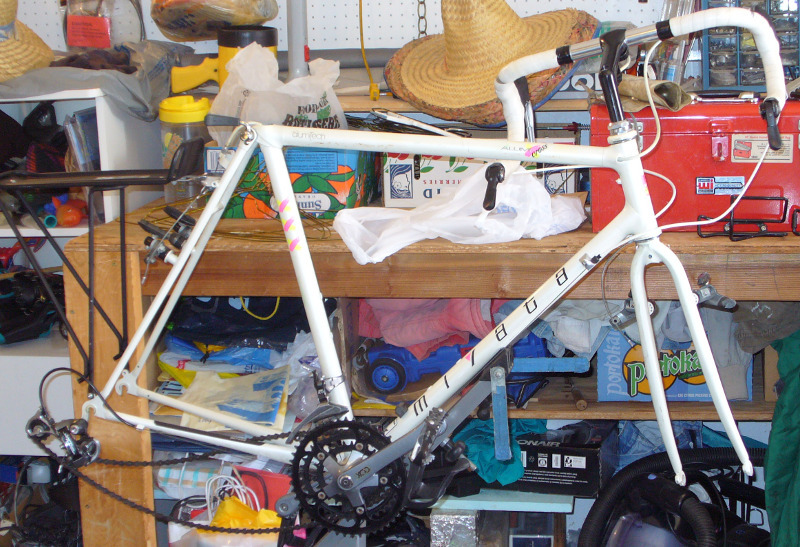 My Miyata Alumicross was most definitely not made for racing, a fact which became very apparent on hills. On long descents when everyone ducked down into a tuck, the air resistance generated by my knobby cyclocross tires resulted in me slowly drifting more and more towards the back of the group, despite the fact that I practically had my nose on level with my headset. And on very small descents, when the group shifted into their smallest sprockets and started pedaling with speed, I was doing 120+ RPMs in my smallest sprocket, struggling to keep up. Nevertheless, I found it to be a highly enjoyable ride, and I will definitely be going out for more group rides in the future. I wanted to be able to have an animated progress bar to be displayed in a terminal for my current Python project. There are already various implementations on the Internet of something like what I wanted, but I couldn't find one that was animated. So for the sake of practice, I decided to write my own. In order to be able to have the bar animated, and still allow the program to get other work done, I had to create a seperate thread to manage the status bar. Code for the bar, (and also sample code to create a demo) are below. Please see http://www.gnu.org/licenses/ for a copy of the license. I got a 1989 Miyata Alumicross earlier this summer and have managed to put a few hundred miles on it so far. We bought it from the previous owner for $200 who apparently had the bike sitting in storage for almost the past two decades, so its in surprisngly good condition despite its age. Almost all of the components on the bike are original, except for the saddle, bar tape, and toe clips (all of which I replaced myself). 58cm, weighing approx. 24 lbs. 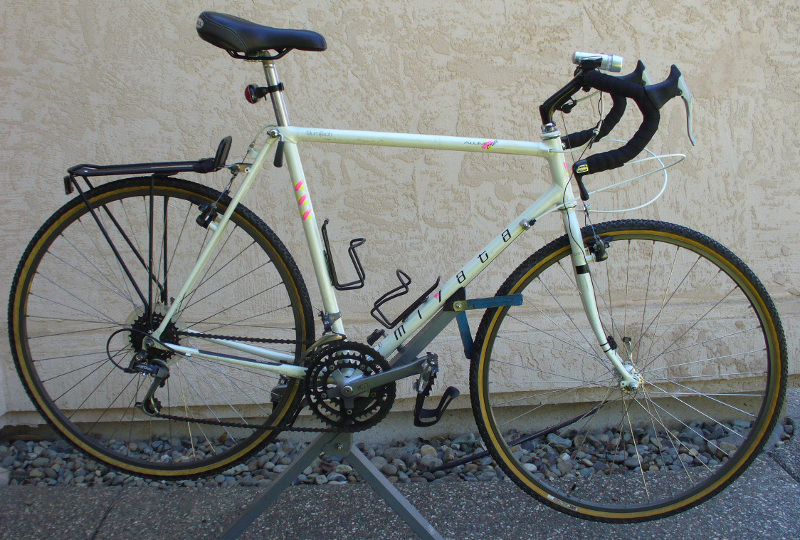 The Alumicross was apparently Miyata's top "cross" bike at the time of its production. 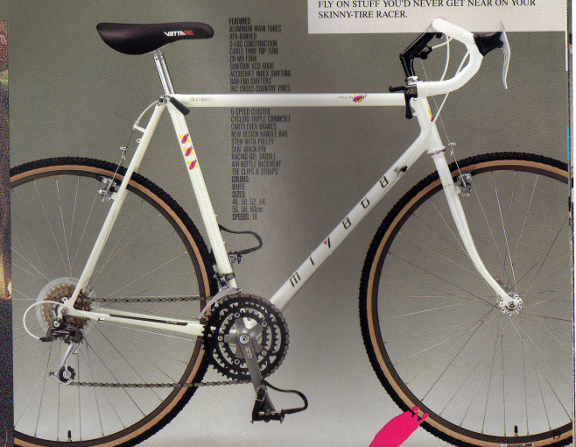 I'm not quite sure if Miyata designed the Alumicross with cyclocross specifically in mind, or if its just a hybrid type bike. Nevertheless, its a good ride, and is light and speedy despite its thicker tires and heavier then normal frame, while still being well suited for cyclocross rides. Its also a good bike for riding around town and doing some recreational riding, and I suspect that it would do quite well at loaded touring since it seems to have all the threaded holes for attaching additional racks and panniers. The low gear gearing and wide gear ratios makes the Alumicross great for long, steep hill climbs while carrying lots of additional weight, but they also mean that the Alumicross is ill suited for high-speed road races. Defenestration is defined as being the act of throwing someone or something out of a window. I was not hitherto aware a word such such as defenestration existed, and am quite frankly astounded that a word was created to describe such an action. I picked up the word today while watching an old episode of Dark Angel online. So Gmail is down again and has been for at least thiry minutes, attempts to access the webpage results in a 502 error. I disallowed IMAP and POP forwarding on my account so I have no way of knowing if IMAP and POP are still accessible, but I am inclined to assume that they're not. Gmail outages while rare, are not unheard of, and I have always ridden out the down times without too much complaining. But Google's mail software is now officially out of beta, and it is not acceptable for a production-ready product to be having these kinds of outages. I may just have to create a 42gems.com e-mail and use that instead of my gmail account as my primary e-mail address.